The marketing chasm that exists today has 66% of consumers believing that the value exchange between brands and consumers is simply one-sided and 70% feel that brands are motivated only by a self-centered desire to exploit profits rather than a sincere commitment to its consumers, according to Edeleman Research, October 2014. As Blogging Out Loud takes a closer look at three of the top marketing trends for 2015 and how marketers can use them to launch successful programs that capture the hearts, minds, and ultimately the business of a target audience, it’s important to remember that pure trends are not the point. Opportunities for your brand are. Here are actionable, innovative tactics that can be incorporated into your brand strategy today to serve up stronger relationships and sales opportunities by the next quarter. 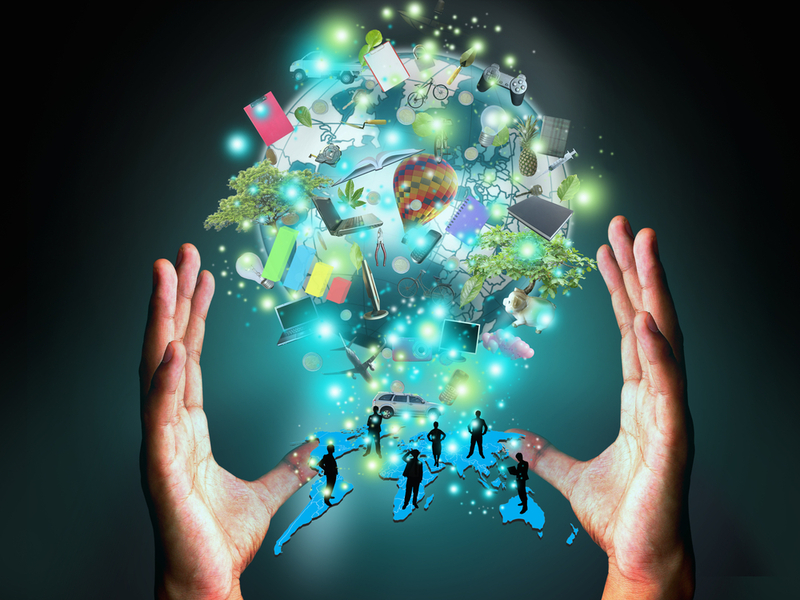 Content marketing still wears the crown and in 2015, it will be more important than ever. Unlike traditional marketing, which aims to sell a product or service, the goal of content marketing is to create and distribute authentic, relevant content that gives the defined audience something of value. “Over two-thirds of marketers are using content more than they did a year ago and they are looking to their trained content professionals to implement a consistent and engaging branded content strategy across all social media,” says Phil Saifer, President of Vertical Marketing Network, an agency that delivers authentic content marketing as part of its suite of integrated marketing services. The old adage “tell, don’t sell” has never been more relevant than in the age of the Internet. According to a study by Roper Public Affairs and Corporate Communication for the Custom Content Council, 80% of business decision-makers said they prefer to get information via articles, not ads. Seventy percent said content makes them feel closer to a company, and 60% said content provided by companies helps them make smarter buying decisions. In order to create content with a real impact, you must invest time in the process. Take the time to understand what your audience wants. 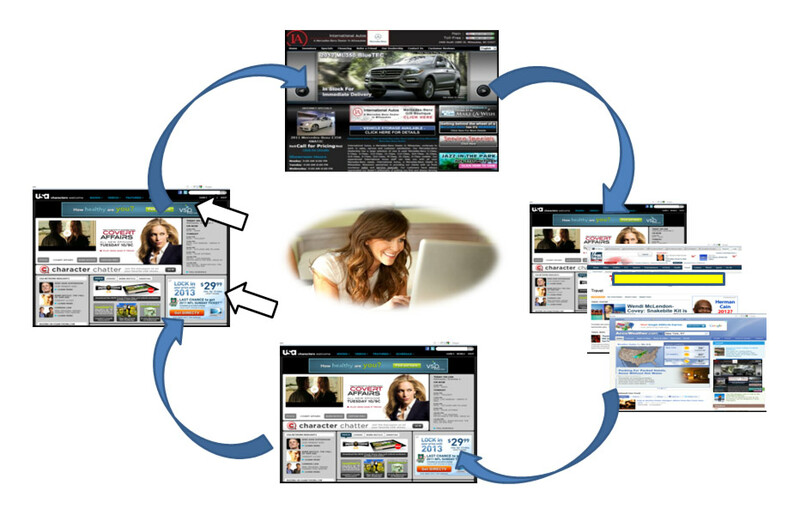 The majority of people go to websites to ferret out relevant information when they make a buying decision. 87% of buyers say online content has a major or moderate impact on vendor preference and selection; but 43% say “blatantly self-promotional” content is a major turn off. Keep this in mind as you move forward with your content strategy. Remember to constantly engage your audience and really listen to their responses. Read all the Tweets that come in. Absorb the Facebook comments. Respond in a timely manner with a positive, willing-to-listen attitude. Ask your target audience what they’d like to see, and then craft your content to meet those needs, ultimately creating brand loyalty and driving consumer action. Also, with an ever-increasing variety of ways to distribute content, your story needs to be consistent across all channels. The data doesn’t lie, as people recall 80% of what they see and do compared to just 20% of what they read, and 10% of what they hear, per research published by Paul Martin Lester of Cal State University, Fullerton. These numbers underscore how vital it is to incorporate visual content into your strategy as well as written content. According to marketing gurus, 2015 will be the year that mobile technology really comes into its own. By 2017, more than one-third of all people around the globe will be smartphone users. With more than 50% of consumers interacting with brand messaging on their mobile devices per the 2014 State of Marketing report from Exact Target, marketers that master mobile marketing can deliver targeted messages directly to consumers via geo-location technologies to reach consumers based on where they are at any given moment. Take Gimbal Smartphone Technology by Qualcomm. In this demonstration from Uplinq 2013, Paul Jacobs demonstrates how Qualcomm is working with the Miami Dolphins to create new in-stadium fan experiences using Gimbal. Qualcomm Gimbal technology will help businesses create new mobile experiences by providing consumers relevant information. Geo-location technology, such as Gimbal, includes short-range beacons that can be built into product kiosks and displays to locate coupon-hungry shoppers. This information gives marketers the opportunity instantly connect with consumers in a tangle, valuable way. For example, a company may send a limited-time-only coupon for a particular item to someone driving by a Walmart, via their mobile device—thus inspiring them to stop by the Walmart and buy whatever is featured on the coupon. In time, marketers predict that geo-location technology will be so highly targeted that it will be possible discern where shoppers are within the store and be able to use that information to send coupons, discounts, or other buying incentives. Imagine this: a mom shopping at Target in the school supply section may receive a text that school uniform shorts are on sale. In a few years time—or less—this type of scenario may become the norm. So how do you make your brand mobile ready? You must have a mobile version of your website in play. With 90 percent of Americans over 18 years old having cell phones and 60 percent being smartphones, mobile web browsing must be made optimized for consumers—clean layout, simpler and more user-friendly operation. Apps can be added to the mobile strategy to keep your audience engaged, provide information, and collect data. But do your research first to make sure an app is right for your company. You’ll soon need a new way to introduce yourself to that charming new neighbor because now, whenever you need an ingredient for a recipe, it can be delivered right to your door. 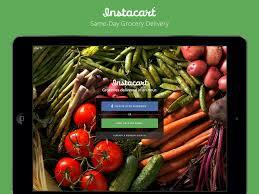 Same-day grocery delivery is a fairly new, but in 2014 the concept showed its chops. In 2015, online grocery shopping and delivery is only going to get bigger. Online grocery companies have made great strides and are still learning how to best market the service they provide. One retailer uses traditional marketing—flyers sent to homes, featuring beautifully photographed images of colorful fruits and vegetables. Others have partnered with so-named “Mommy bloggers” to get the word out there. As a growing industry, it will be exciting to see the marketing tactics these companies employ to attract the users they need to keep the business model moving forward. The biggies—Costco, Whole Foods, Target, and Walmart—expanded their same-day delivery services in 2014 to large cities like Boston, New York, San Francisco, Denver, and Chicago among others. In 2015, start ups like Instacart, are making their mark. The two-year-old start up grew by 15% – 20% this year. Its strategy? First, it’s not a “delivery service”—Instacart describes itself as a software company that connects customers with personal shoppers. Shoppers select groceries from the stores featured on the Instacart website or mobile app—Whole Foods, Trader Joe’s, and Safeway. Instacart sends a screened personal shopper to fill the order and then delivers the items within 1 or 2 hours. Uber, Overstock, and several other companies are looking at ways to open their own delivery services, from Uber’s 10-minute grocery delivery (when you really need that sugar!) 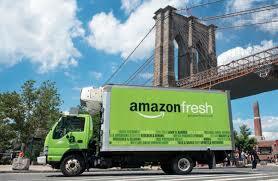 to Amazon Fresh’s potential partnership with the creators of the popular Look & Cook mobile app. Marketing trends are the result of careful analysis, close study of analytics, and, of course, a good dose of instinct. Ultimately, successful marketing is about being at the right place at the right time with the right message using the right tools. And today it is about providing consumers with a two-way relationship with content they can use, in the way and place they want to consume the information. It is also more and more about added convenience so it is easier for them to consume your product or service. The opportunities are right in front of your brand to be a leader in its space. Another trend: social plug-ins will be ubiquitous. Social shares serve as a stamp of approval. If a viewer sees something has thousands of shares, they conclude it must be of value. 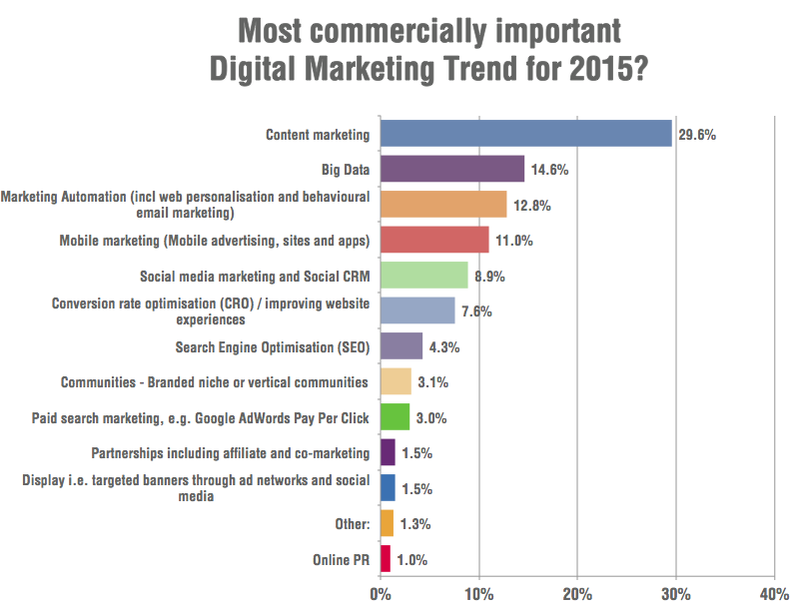 So what are your thoughts on these marketing trends? There’s a lot out there, and we’d love to hear what you feel is most important as we move forward. Share in the comment section below. This entry was posted on January 28, 2015 by Kim Haman in Uncategorized and tagged 2015, Consumers, content, Digital Marketing, Marketing, marketing trends, Mobile, tools.